Today, if you want information on an animal, you might turn to the internet, and look it up on Google or Wikipedia. If you want information on the Wildlife Conservation Society, the Bronx Zoo, or one of the other wildlife parks, you might go to their website, read their FAQs, or go to the “contact us” page for email information. 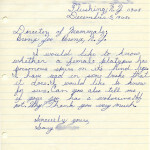 In 1965, however, such information was not a just a click away. 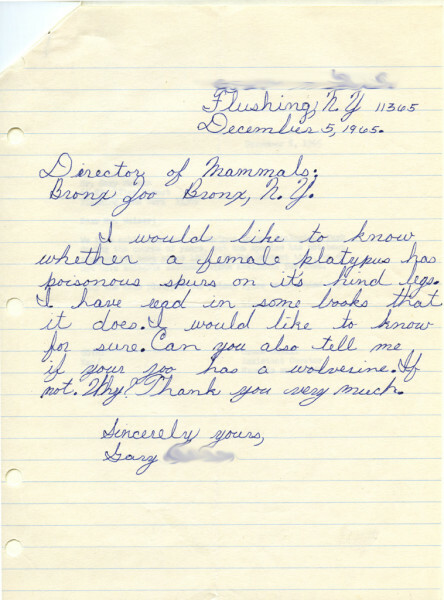 If you had a school project, or needed animal information for another reason, you might write to the zoo. 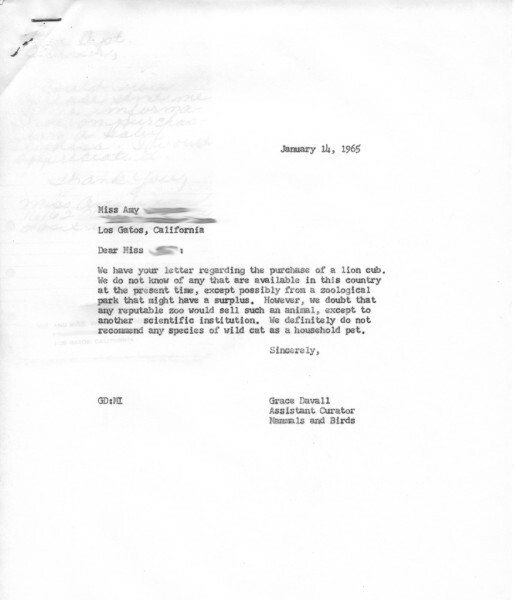 And if you were Assistant Curator of Birds and Mammals Grace Davall, part of your job would be responding to these inquiries. 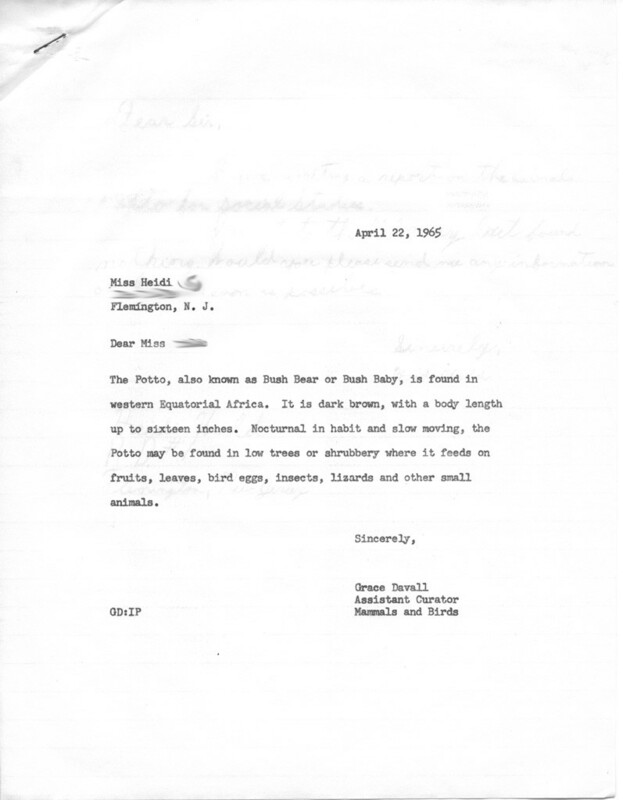 Not everyone who wrote the zoo just wanted information about wild animals–some wanted to procure the animals themselves! Requests for price lists or names of animal dealers were refused, often with a gentle admonition that such animals were illegal or did not make good pets. Sometimes, someone already had an animal, and needed to find out how to feed it–or what to do with it. 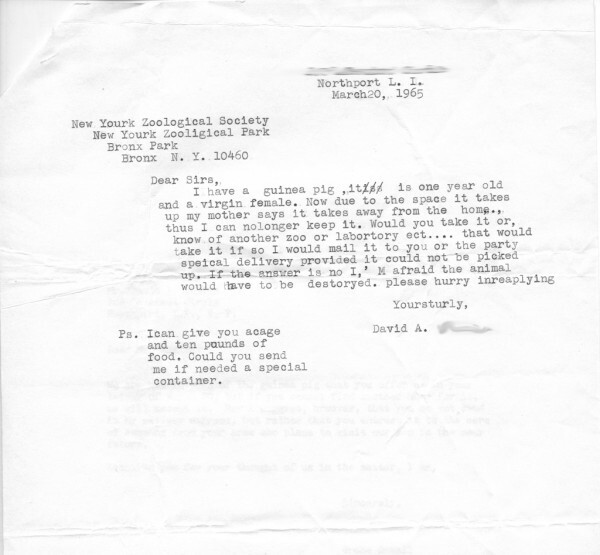 While today the Bronx Zoo does not accept donations of animals who need new homes (see the FAQ), in 1965 Miss Davall advised a young boy that they could take his guinea pig–but cautioned him not to send it in the mail! 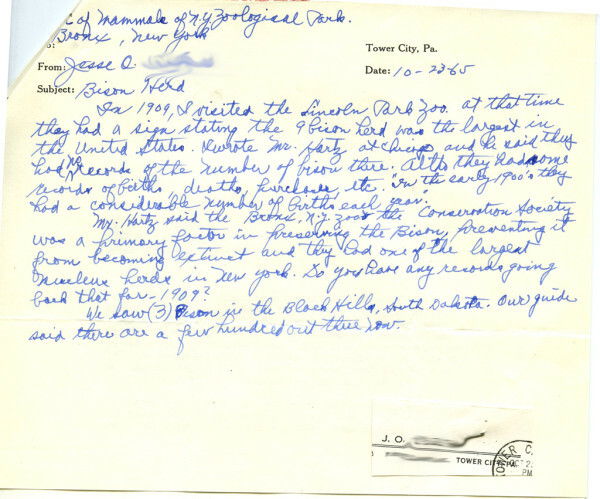 This post is by Helen Schubert Fields, who worked during Fall 2014 with the WCS Archives as an intern processing the records of the Assistant Curator Grace Davall. All items pictured are from that collection: Grace Davall records, 1938-1973. Collection 2069. 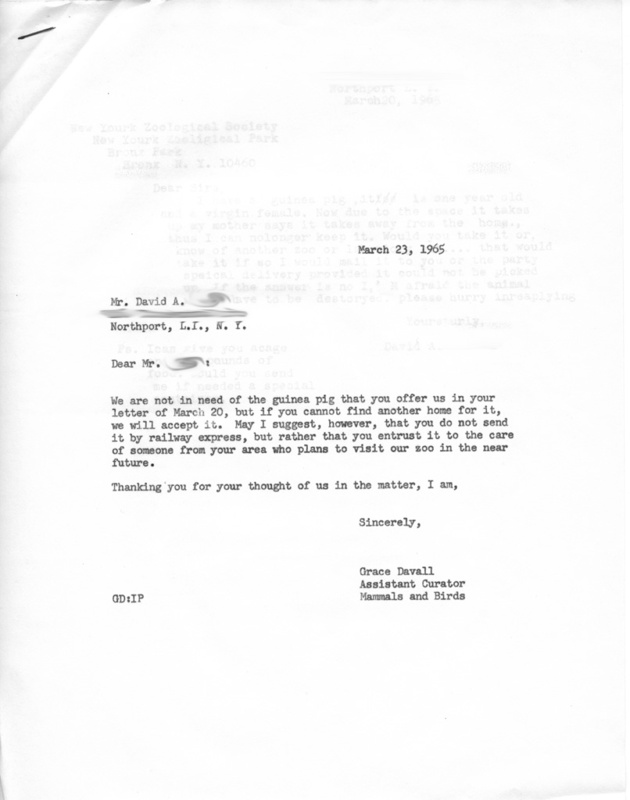 Wildlife Conservation Society Archives, New York. 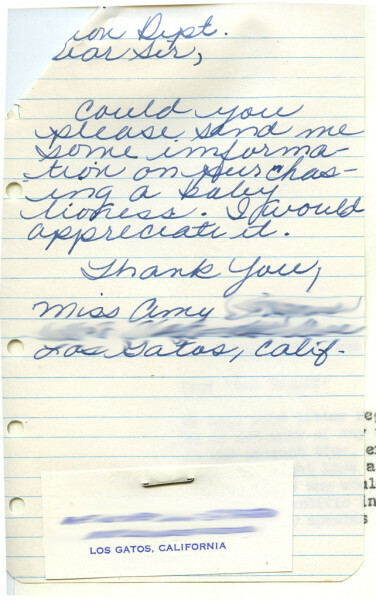 Any personally identifying information in these letters has been blurred for online display. was it not Grace Davall who, reluctantly and for the Park’s promotional strategy, allowed herself to be photographed with a boa constrictor wrapped around her upper body? 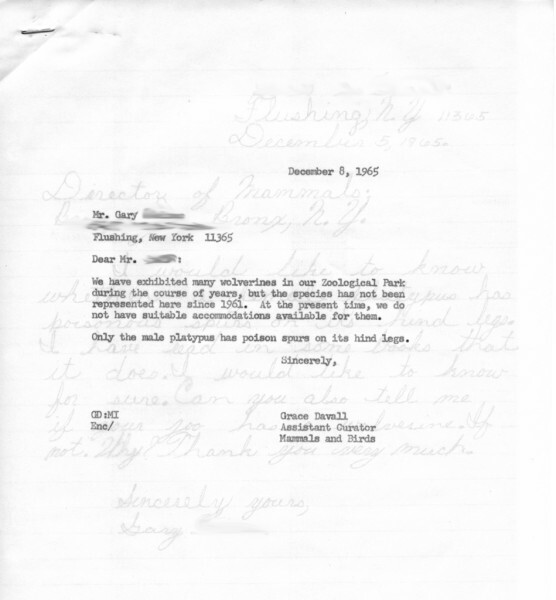 I’m not sure about the Park’s promotional strategy part, but you’re right — that was Grace Davall. She’s a really interesting figure in WCS history, as you see in this post! Thank you for this terrific post! 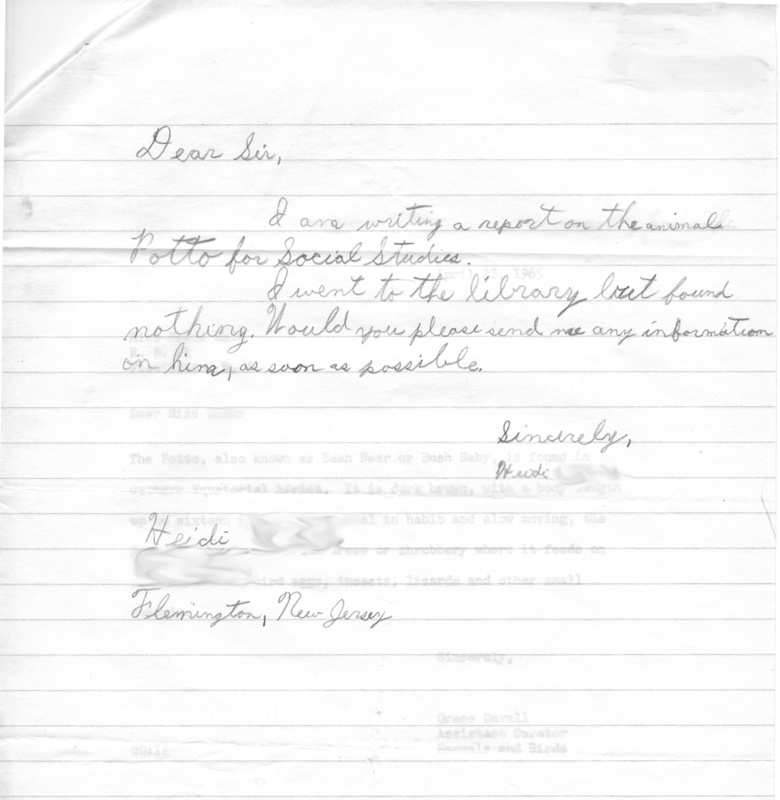 What a fascinating look into information access before the advent of modern IT. When I started university in 1989 at Northwestern in Chicago, the student center had a service where you could call the main desk 24 hours a day and ask them any type of question. They would then do their best to find out the answer and call you back!